Colt Model 1903 Pocket Hammerless .32 ACP factory box for the Type I - Box dimensions are 7 1/4" (l) x 4 3/4" (w) x 1 1/4" (d). Box features earliest style light blue label with black writing describing the contents as an "AUTOMATIC COLT PISTOL." 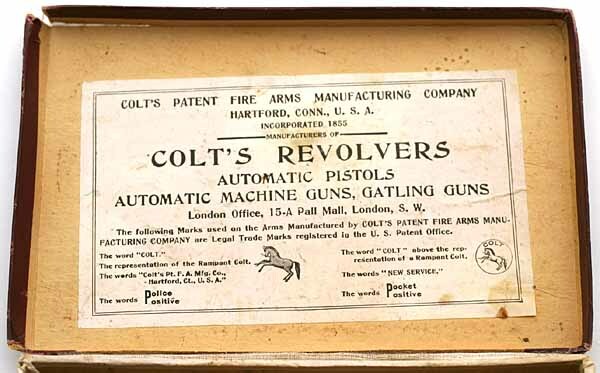 While the contents of the label remained the same, the order was later changed on the Type II pistol boxes to read "COLT AUTOMATIC PISTOL"
Inside box label references Automatic Pistols, Automatic Machine Guns and Gatling Guns as well as the London Office at 15-A Pall Mall, London S.W. Type I box bottom photo to illustrate construction of the box. Also note the hand written serial number on the bottom of the box at the top of the photo. As the pistols entered Colt's shipping room, the serial numbers were recorded in pencil on the bottom of the box. These numbers were entered into the shipping ledgers as the guns were shipped to fill orders. Comparison to show the slight difference in length between the Type I and Type II Colt boxes. The box on the left is the Type I box; on the right is the Type II box. The length of the Type I box is 7 1/4" as compared to the length of the Type II box which is 7 1/16". 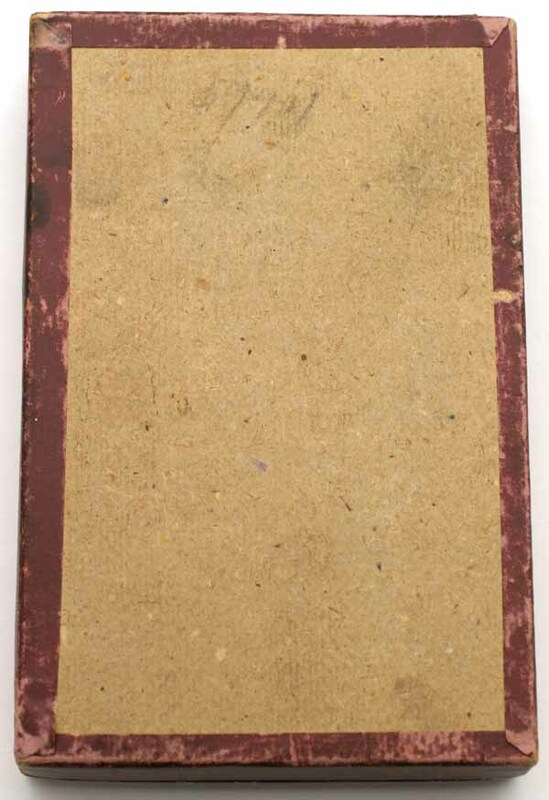 The Type II boxes had an additional piece of paper covering the bottom of the box, which covered the edges of the maroon box covering presumably to strengthen the box. Colt Model 1903 Pocket Hammerless .32 ACP factory box for the Type II - Box dimensions are 7 1/16" (l) x 4 3/4" (w) x 1 1/4" (d). 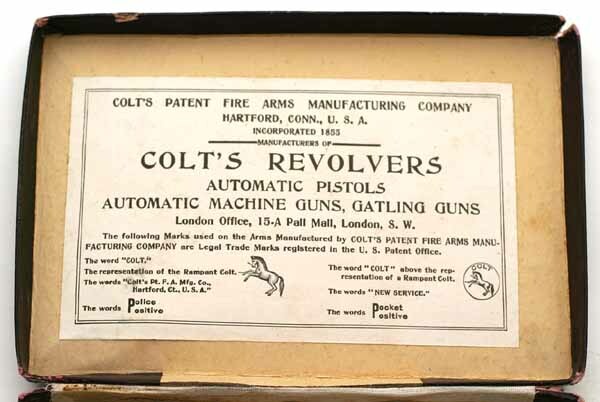 Box features second style light blue label with black writing describing the contents as a "COLT AUTOMATIC PISTOL" While the contents of the label remained the same, the order was changed from the Type I pistol boxes which read "AUTOMATIC COLT PISTOL." Inside box label for the Type II references Automatic Pistols, Automatic Machine Guns and Gatling Guns as well as the London Office at 15-A Pall Mall, London S.W. 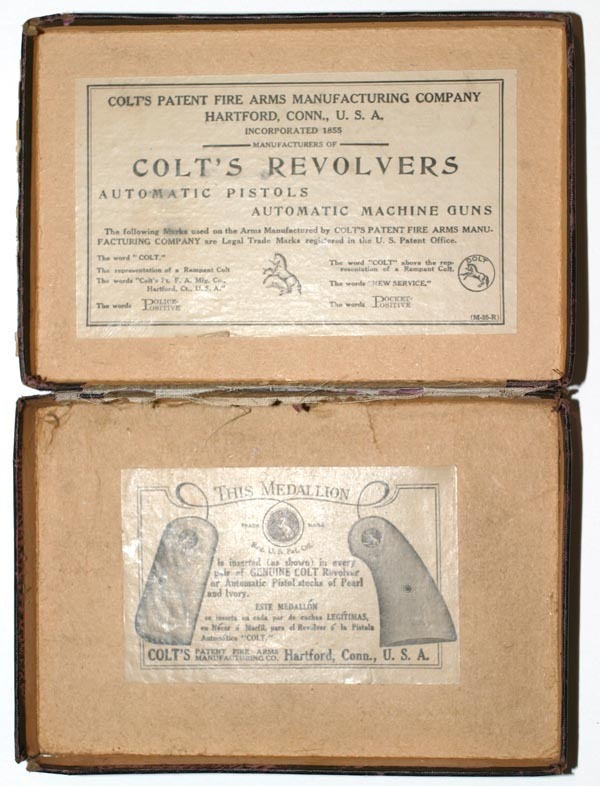 The text of the label is essentially the same as the inside label of the Type I box pictured above, however, the rampant Colt near the bottom center of the box is an updated logo. Colt Model 1908 Pocket Hammerless .380 ACP factory box for the Type III (ca. 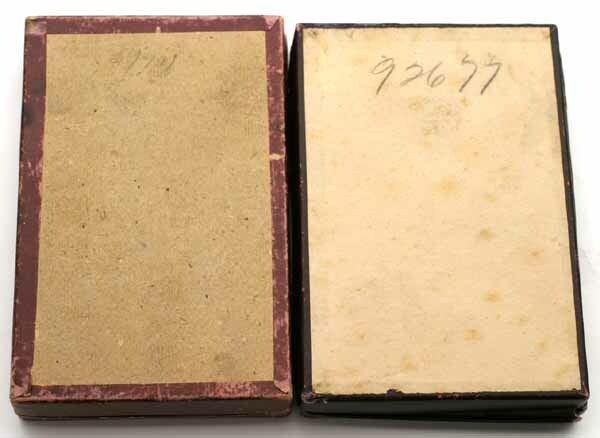 1915) - Box dimensions are 7 1/16" (l) x 4 3/4" (w) x 1 1/4" (d). Box features second style light blue label with black writing describing the contents as a "COLT AUTOMATIC PISTOL" The boxes for the caliber .380 pistols also have a "HAMMERLESS." label on the top end flap of the box, above the standard end label. The contents of the label remained the same as the label on the Type II box. Serial Number written on bottom in pencil. Colt Model 1908 Pocket Hammerless .380 ACP factory box for the Type IV (ca. 1938) - Box dimensions are 7 1/16" (l) x 4 3/4" (w) x 1 1/4" (d). 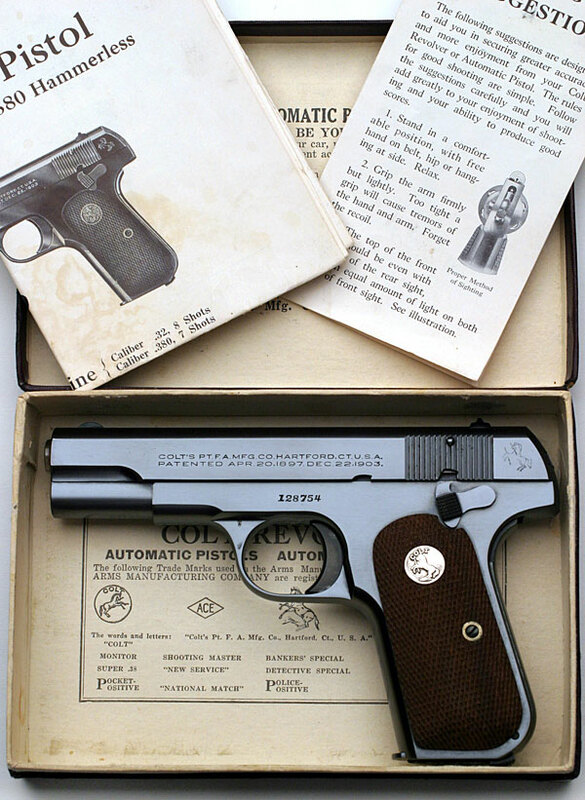 Box features fourth style dark blue label with white writing describing the contents as a "COLT AUTOMATIC PISTOL" The boxes for the caliber .380 pistols also have a "HAMMERLESS" label (shortened with no "." at the end) on the top end flap of the box, above the standard end label. The contents of the label remained the same as the label on the Type II & III boxes. Inside box labels are printed inside the box. Questions / Comments? Contact Us! Copyright © 1996 - 2019 by Coltautos.com. All rights reserved. The Coltautos.com logos and all proprietary artwork and photos are the property of Coltautos.com and may not be reproduced or distributed without expressed written permission.